Beyond doubt, MPEG Streamclip for Mac is widely installed and used because of many attractive advantages. The primary factor for adopting must be uncharged so that downloading Mac MPEG streamclip is absolutely a great option for majority people who are eager to seek for the free video converter. But, some unexpected MPEG Streamclip Mac not working problems may happen in the process of converting videos. Thus, in this article, not only you can learn how to transcode videos with MPEG Streamclip for Mac, but also you will know the easiest way to transcode videos with Mac MPEG Streamclip alternative. * Operating system supports both Mac and Windows. * Work as a video player, YouTube downloader and an editor with cutting, copying, pasting and trimming settings. * Allow users to set the output parameters for target videos. * Convert videos to multiple formats and devices for limitlessly playback. * Supported input formats: MPEG, VOB, PS, M2P, MOD, VRO, DAT, MOV, DV, AVI, MP4, TS, M2T, MMV, REC, VID, AUD, etc. Tips: Though multiple video formats are supported by MPEG Streamclip for Mac, some users also come across various problems, for example incompatible with the latest Mac OS like macOS Sierra, error messages like "won't read or open files" or "unrecognized file format", etc. That is why these people cry out for other best video converter for Mac. MacX Video Converter Pro is able to easily convert videos to MP4, MKV to AVI, etc 180+ video formats and 14 popular audio formats on Mac OS X (macOS Mojave incl.). And it also supports editing videos (cut, crop, merge, rotate, special effects, deshake, etc.) and downloading videos/music from YouTube, Facebook, Vimeo, etc 1000+ sites. After download and install this excellent and lightweight video conversion app on your Mac computer, you can proceed to it according the following instructions. Step 1: Drop your movie into the main interface of MPEG streamclip Mac and it will appear and play back using the transport controls. Step 2: Choose File > Export in order to export a file to a new format. If you want to export it to an Apple device, you'd better choose File > Export to MPEG-4 (iPhone video format). And then you will see a list of Apple devices so that choosing a favorite one could be possible. Step 3: Adjustment the preset parameters for video. In this step, you can manually adjustment the video parameters settings, choose de-interlace option, alter brightness, contrast, and saturation and add a watermark, etc. Actually, the user interface can't be changed easily and about the function of downloading video from YouTube, maybe the developer has already began to improve. For those people who are badly desire to convert videos or download songs from YouTube, the wisest choice is getting a Mac MPEG streamclip alternative. MacX Video Converter Pro to you. Built in more than 370 codecs, this program allows you to convert any video to over 180 video formats and 14 popular audio formats on Mac OS X (macOS Mojave included), such as M2TS to MP4, MKV to AVI, HEVC to H264, 4K to 1080p, etc so that you can easily play on over 420 portable devices including iPhone, iPad, iTunes, iMovie, HTC, Samsung Galaxy phones/tabs, WP8 Mobile, Xbox, Chromecast, etc. Plus, the advanced functions can meet your diverse needs such as download YouTube videos Mac, make photo slideshow, record screen, edit video, etc. 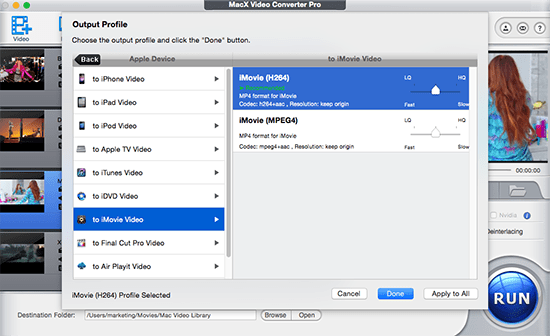 Moreover, the friendly user-interface of this video converter Mac will let the newbie handle it with ease. Rather, four steps can solve the requirement of transcoding a video file including loading the video files, choosing the output format for the wanted video, selecting an output folder to save the output video and clicking "RUN" to start converting. Tips: In the process of converting, you can set the multi-core CPU use according to your Mac configuration, which could speed up the whole conversion a lot. After finishing the task of converting videos, in fact, you can apply MacX MediaTrans to transfer the converted video file to mobile devices for playback without any limits. Besides, this iOS file manager is also able to download videos/music from iPhone iPad iPod to Mac as well as transfer photos from iPhone to Mac.